Dr. Walter Miller, a pioneer medical and education missionary. Likita Mila yana son Hausawa da Fulani fiye da misali. Idan da za a kirga irin aikin da ya yi na taimako dai dai da dai dai da kowa ya yi mamaki […] Idan akwai Turawan day a kamata a tuna da su saboda aikin cid a da kasan nan tamu gaba, idan akwai wanda ya isa godiya ga dubbai, idan akwai wnada ya kamata a rubuta tarihinsa da rubutun dutse, ko da kumfan zinari, Likita Mila yana daya daga chin wadannan. Walter Richard Samuel Miller was the only son out of the eight children born to his parents. At his birth in 1872, his mother, who had been looking forward to having a son, decided to name him Samuel and dedicated him to the service of the Lord, thus following in the footsteps of Hannah in the Bible. Young Samuel was converted at the age of fourteen at a children’s special service mission held at Clifton College. As he was growing up, Samuel nurtured the thought of working in the colonial bureaucracy in India although his father wanted him to go into business. He ended up, however, in medical school–St. Bartholomew’s Hospital Medical School being the obvious choice for him. While attending one of the camp meetings at Keswick, Miller considered becoming a missionary doctor after listening to Mrs. Bird Bishop tell stories of the needs she saw during her travels in Tibet. He filled out the declaration form from the Student Volunteer Missionary Union (a part of the Student Christian Movement) to register his intentions of becoming a missionary. He had considered northern Nigeria as a possible option to begin his missionary career and had in fact spent three months in Egypt studying Arabic in preparation for such a venture but Hausa–not Arabic–had captured his attention. Nevertheless, an appeal from Canon–later Bishop–Taylor Smith, a missionary to Sierra Leone, to assist in the growing medical needs in Freetown took him to Sierra Leone instead of northern Nigeria in 1897. However, Miller did not stay long in Freetown as a bout of malaria sent him home not long after his arrival there. Nigeria continued to be an attraction for Miller. In England he assembled a team of likeminded people that included Bishop Herbert Tugwell, E. A. Richardson, Claud Dudley Ryder, and Richard Burgin, and they began to make preparations to visit northern Nigeria. But before setting out they were sent to Tripoli, Libya, for further Hausa language training. In Tripoli Miller met Abdul Majid Tafida, a lad from Kastina in northern Nigeria who had accompanied his father on a pilgrimage to Mecca. The lad’s father had died in the Sahara desert en route to the Holy Land but the lad, undeterred, had continued on, wanting to complete the religious obligation. Miller helped him reach Mecca and promised he would see him again in Egypt upon his return. But by the time Abdul Majid got back from Mecca, Miller had returned to England on his way to Nigeria. The party of five young men left Liverpool in 1899 and arrived in Lagos around Christmas that same year. Their goal was to get to the city of Kano, famous among the Hausa but little known to Europeans. A year earlier Canon Robinson had visited Kano and learned quite a bit of Hausa-enough to write out its grammar–but he had also, as Miller noted, “experienced almost unbelievable difficulties.”  Apart from doing missionary work Miller was commissioned by the British and Foreign Bible Society to translate the Bible into Hausa. In January the party began its journey on horseback and on foot from Lagos to Kano–a distance of about 800 miles. Finally after three months of a long and toiling journey the missionaries got to Kano through Zaria, another Hausa town south of Kano. In Kano the party received a cold reception from Emir Aliyu the Great who refused to grant any of their requests. The emir told them, “Start a school? No. We have our own and our children are taught the Holy Kur’an. Medical work? No. Our medicine is in the Holy Kur’an and the name of Allah! We don’t want you; you can go. I give you three days to prepare–a hundred donkeys to carry your loads back to Zaria, and we never wish to see here again.” Miller and his companions would have been killed but for the intervention of the Waziri (Prime Minister) who refused to allow any harm to be done to them. The emir of Zaria was equally reluctant to allow them to settle in his domain. As they wondered where to go, as they did not intend to return to Lagos, they got a letter from Colonel Lowry Cole who was “in charge of a military expedition to take over the Hausa country”  asking them to move southward from Zaria to a military camp in Girku where they could be given protection until an agreement could be reached with the emir of Zaria. While waiting for further instructions in Girku, Claude Ryder died of dysentery followed by E. A. Richardson three days later. Then came the bad news: all the British soldiers had to go to Ghana to fight in the Ashanti-British war. With the soldiers gone, The missionaries lost their protection. The Emir of Zaria Kwasau ordered some “highwaymen” to destroy the temporary mission station. One early morning as Miller recalled, “All our huts were on fire; our stores, my medical instruments and drugs all burning; our sleeping hut and little grass church alone remaining.” Afterward Governor Lord Lugard ordered the missionaries to leave Girku and move southward to Loko, on the Benue River, where two other missionaries recently recruited for the Hausa mission, Rev. G. P. Bargery, and Hans Vischer, met them. Meanwhile, Bishop Tugwell had returned to his diocese in Lagos and Miller, sick with malaria, went back to England along with Burgin, the fifth member of the original party. Thus ended the first attempt to begin mission work among the Hausa. Only Bargery and Vischer remained in Loko. In England Miller made contact with Abdul Majid, the lad he had met in Tripoli who was staying with some missionaries in Egypt. Arrangements were made for Abdul Majid to meet Miller in England. The two returned to Nigeria in 1901 but when they got to Loko, only Bargery was there; Vischer had left to attend his father’s funeral in Switzerland. Meanwhile, the situation in Zaria was now favorable to mission work as the colonial soldiers had saved Zaria from attack by a notorious slave trader named Nagwamachi, the emir of Kontagora also known as the “King of the Sudan.”  This endeared the British to the emir of Zaria and, as an act of gratitude, he invited Miller and his colleagues to Zaria. Miller and Bargery arrived in 1902. The emir gave Miller a place to build a mission compound. Having settled down, Miller began translating the Bible and started his medical work. Nevertheless when he realized that the people did not trust his medicine he decided that the better option was to open a school. This initiative did, indeed, prove more successful as the emir and some of his courtiers sent their children to the school. Miller kept a dispensary open, however, as a way of gradually gaining the people’s confidence in the white man’s medicine. The school began as a boys’ school but later girls were admitted. To help the girls, missionary ladies were recruited, one of whom was Miller’s sister Ethel who would later gain a reputation for unguarded attacks on Islam. News of Miller’s school in Zaria spread throughout northern Nigeria and the new students were recruited from beyond Zaria even as far away as the Plateau, Kabba, and Niger provinces. The mission compound expanded rapidly but this growth created tension between the mission and its hosts. The situation worsened with the arrival of children of Hausa converts who had already heard about Isa (Jesus) through a fiery Qur’anic teacher, Ibrahim. Ibrahim had taught that Isa was superior to Mohammed and had begun to revere Isa above the Prophet. Before being impaled in the market square in Kano for refusing to recant his teaching, he had asked his followers to flee Kano to neighboring Hausa cities to await preachers from the West who would tell them more about Isa. Some of Ibrahim’s disciples (called Isawa or “the followers of Isa”) met Miller in Zaria in 1913 and told him their stories. The Isawa children soon formed the majority of the students in Miller’s school in the city. The growth of the Christian population in the city required more space but the emir would not allow further expansion except outside the city. Miller also became engrossed in the politics of the emirate because he saw that Zaria suffered under the rule of their oppressive emir named Aliyu. This involvement endeared Miller in the hearts of the ordinary Hausa who came to him at night to tell him about atrocities committed by the emir. Miller began to send reports of his abusive regime to the colonial Resident  of Zaria Province, Captain Abadie, also known to the Hausa of Zaria as Mai Jimina (“the owner of an ostrich”). As a result, Emir Aliyu was dethroned in 1921 and sent into exile. As the new emir feared Miller and did not want him in the city, in 1929 the mission was moved to a nearby site about two miles outside the city and given the name Wusasa. Discouraged at losing his friends in the city, Miller moved to Kano to continue his translation of the Bible into Hausa. He finished it in 1932 and it was published by the British and Foreign Bible Society that same year. Since then, the Miller Hausa Bible has been of immense help in evangelism among the Hausa in northern Nigeria. The first four indigenous missionaries to the Hausa sent by the Sudan Interior Mission–all of them from the Tangale ethnic group–considered the Miller Hausa Bible their most significant tool for evangelism. Miller’s work in Kano became less exciting at that point. He was much more involved in the local church than in any meaningful evangelistic work among Hausa Muslims. After finishing his Bible translation work, Miller became a bit idle and decided to return to England for good. But England had changed and definitely had nothing to offer Miller, now in his sixties. He resigned from the Church Missionary Society in 1935 and returned to Nigeria where he eventually settled in Bukuru, a tin mining city south of Jos in the Plateau Province. There he devoted himself to writing projects–one of which was his own biography–and to teaching Hausa as he was now considered an indisputable authority in the language. 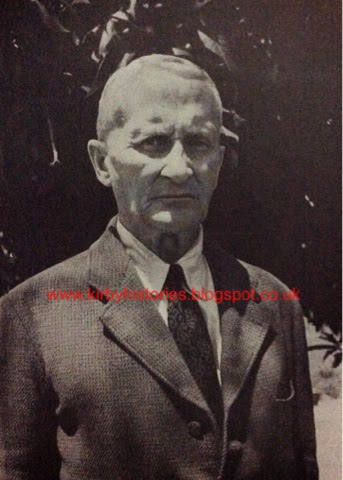 At that time Miller was, as he put it, the “oldest remaining European resident in Nigeria.” He died on August 27, 1952 at the age of 80 and was buried in St. Piran’s cemetery in Jos. Certainly E. A. Ayandele is right to have called Miller “the best known white man in Northern Nigeria.” Miller devoted the best part of his life to Nigeria where he labored for fifty-five years–perhaps the longest a white missionary has ever served in that country. Miller never married due to what he called his puritanical background, but adopted African children. The best known of Miller’s adopted children were Abdul Majid Tafida (Miller) whom he had met in Egypt and the Rev. Henry Miller, a redeemed slave from Chad. The Majid Tafida family became the first Christian family in Katina Province. One of Henry’s daughters, Mrs. Maude Akanya, was the first woman in northern Nigeria to be appointed a commissioner. Dr. Miller is survived by many grandchildren and great-grand children.